Can a queen lay eggs of certain types of ants at will? The queen ant of a newly established colony lays eggs continuously which exclusively hatch into larvae destined to develop into worker ants. Why can worker ants be produced exclusively even though that ant society is, in principle, composed of three castes, consisting of males, females, and workers? Are queen ants able to intentionally lay eggs that are destined to become worker ants? After mating, a young queen becomes an egg-laying specialist. During the marriage flight, the male partner transfers to the seminal receptacle of the queen all the sperm cells that she will have for the rest of her life. At the time of egg-laying, the queen may or may not fertilize eggs at will by using or not using, respectively, the sperm cells provided by this mating partner and retained in the receptacle. An unfertilized egg is destined to develop into a male ant, and a fertilized egg, if undernourished after it hatches into a larva, a worker ant. In this way, the queen ant can intentionally lay eggs destined to develop into a specific caste. Any female-producing egg is capable of developing into either a worker or a queen, on the condition that a well-nourished egg or larva develops into a female ant (potential queen) and undernourished egg or larva, into a worker ant. Ants of the Pristomyrmex pungens species do not construct a nest. Strangely, only worker ants of this species set up a kingdom without a queen or a male ant. In the ants of the Pristomyrmex pungens species, it is the worker ants that lay eggs without mating. Those worker ants do not have sperm cells. Therefore, their eggs should develop exclusively into male ants, but, for some reason or other, only worker ants (female ants) develop from their eggs. The reason for this remains a complete mystery. 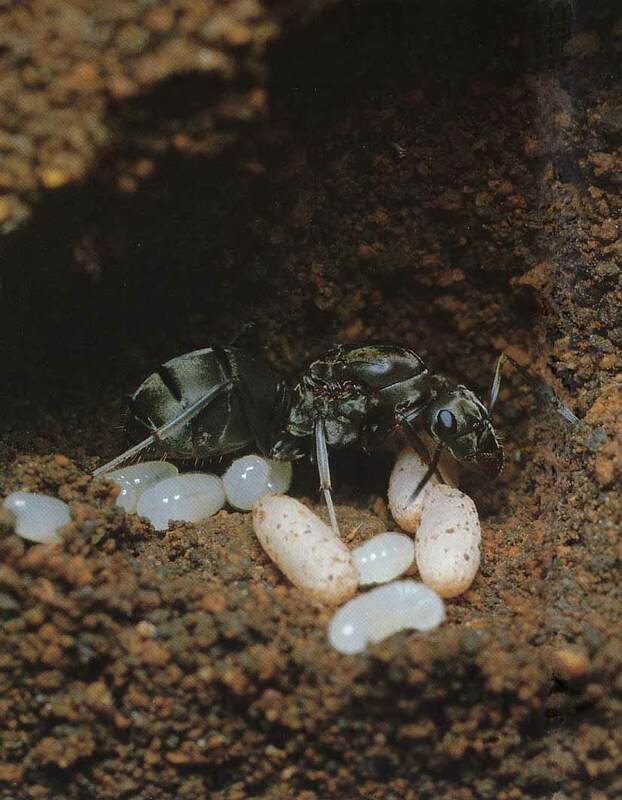 In ants of the Pristomyrmex pungens species, worker ants lay eggs.